2 of 4 In a large bowl, combine meatloaf mix, panko, eggs, scallions, ginger, onion powder, five-spice powder and soy sauce. Form into 12 meatballs, about 1/3 cup of mixture for each. 3 of 4 Combine beef broth, ketchup, tomato sauce and vinegar. 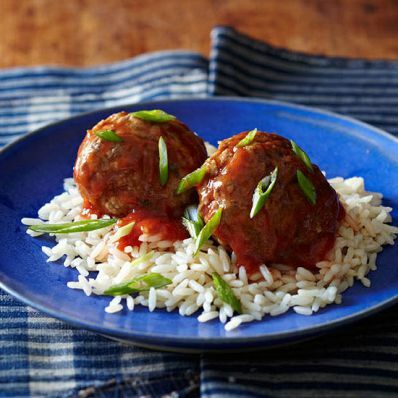 Pour into slow cooker; place meatballs in bottom in a single layer. Cover and cook on HIGH for 6 hours or LOW for 8 hours. 4 of 4 Serve with rice and garnish with sliced scallions.